What Does James Bond Drink? 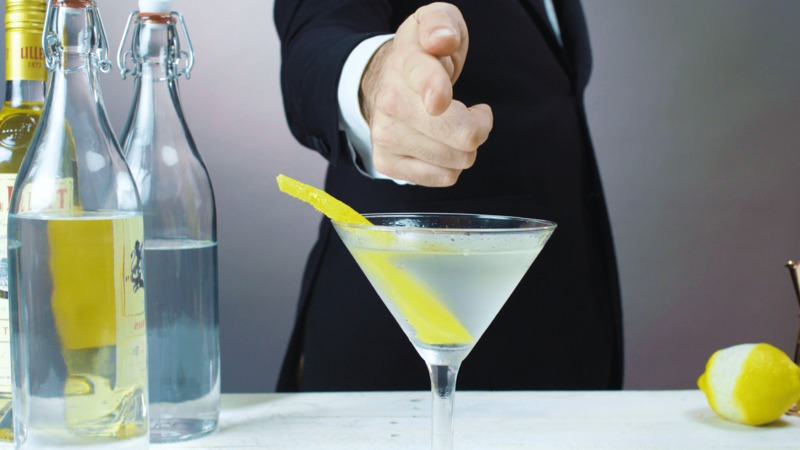 Although the Vodka Martini, "shaken not stirred," is the cocktail that James Bond is best known for, it is not the only one by far. There are actually many mixed drinks which the famous spy has sipped through his adventures in both the movies and Ian Fleming's novels and most of them are classic cocktails. One thing is for sure; he does have great taste in drinks. Would we expect anything less from 007? In some of the more recent movies, it seems to be more about product placement (Heineken, anyone?) than the traditional Bond image as a cocktail connoisseur. Let's forego those and look at some of Bond's favorite drinks. Although the "average" Vodka Martini is better known in Bond's adventures, it is the Vesper Martini that is the "true" Bond Martini. It was the first mentioned and the one that he claims to have invented it (the only time he drinks one in the movies or novels). The recipe for the Vesper is dictated in Chapter 7 as follows and is named for the lovely Vesper. If you have not had a properly made Vesper Martini you are missing out on a fantastic drink. We have all heard the line, and many of us have used it in a Bond-style on occasion ourselves... "a Vodka Martini, shaken not stirred. " Throughout the series, it is the catch phrase for Bond's (and Fleming, so the story goes) preferred Martini. After Champagne, the Vodka Martini is the drink most often consumed by Bond (over 20 times). In the books, it is outnumbered by the Scotch and Soda. Does James Bond ever drink Gin Martinis? The answer is that in the movies (to date) he does not. In Fleming's novels, Bond has a total of 19 Gin Martinis. So, yes, Bond did enjoy a Gin Martini or two, it just seems that vodka is a little sexier for the big screen. There are also many instances in both mediums in which the drink is certainly a Martini, but it is unclear whether vodka or gin is used. James Bond's desire for a Scotch and Soda was lost in the production of the movies, but it is the mixed drink he has most often in the books (a total of 21 times). Of course, a good Englishman will gravitate towards Scotch, but he also had his share of Whiskey and Soda (most likely it was often with American bourbon) and even more Brandy and Soda (or ginger ale). Simple and effective, these are quick drinks that are perfect for a spy on the go. While this quick mix was a favorite of Bond, he is also seen numerous times (just a few less than Champagne in total drinks) drinking straight bourbon and Scotch (in that order). If Bond was that fond of Scotch and Soda, it's only natural that on occasion he went for the white spirits. Both the Vodka Tonic and Gin & Tonic make appearances in his adventures. As with the Martini, the vodka version is favored over the gin. It's believed that the occurrence of one or the other reflected Ian Fleming's preferences at the time of writing each novel. In 1958, Fleming allowed Bond four Gin & Tonics in Dr. No and by 1963's On Her Majesty's Secret Service the tone had switched to four Vodka Tonics in the novel. In this instance, Bond also adds one of my favorite "secret ingredients" for either of the tonics, Angostura Bitters. The Americano is significant in the adventures of 007 because it is the introduction to his refined drinking style. This is the first drink mentioned in, but it wasn't until From a View to Kill that we learn when Bond feels that the Americano is a more appropriate drink. According to the story, a drink like this is better suited for dining at an outdoor cafe (in this case French). We also learn of his preference for "Perrier, for in his opinion, expensive soda water was the cheapest way to improve a poor drink." James Bond sure is a picky drinker! Another classic cocktail that 007 drank on occasion, the old-fashioned is (once again) one of those forgotten in the cinematic stories. Between Diamonds Are Forever, Live and Let Die and Thunderball, Bond's old-fashioned count builds up to four in the books. The popular whiskey cocktail is often enjoyed with a meal or as a nightcap on the rare occasions that the busy spy gets any sleep, and it's almost always a double. When thinking about his style, the Stinger is possibly the most un-Bond-like cocktail he drinks. This simple brandy drink is not only his favorite to share with Tiffany in the Diamonds are Forever novel, but in Thunderball, it is paired with coffee at the Nassau Casino bar while drinking with Felix Leiter. As great a cocktail as the Stinger is, that touch of creme de menthe could be the reason it has not been seen in the films. It is, after all, not the manliest of drinks (see Negroni reference below), nor is it the most popular, the sexiest or marketable. On the flip side of the book versus movie appearances, the Mojito is one of the very few to be on the big screen and not in writing. This happens very late in the movies (2002's Die Another Day) and is a possible reflection of the popularity of the cocktail at the time of production. It was a fitting choice for the Cuban setting as well. As is his usual style, 007 uses this drink to introduce himself to the beauty of the story, in this case, Jinx. Oddly enough for a classic English series of novels with this much drinking, a favorite like the Black Velvet is only mentioned once. In Diamonds are Forever, Bond and Bill Tanner stop by the famous Scott's in London for "dressed crab and a pint of black velvet." Stout, Champagne and seafood, what a lovely combination. In the short and obscure story Risico quite a few drinks are mentioned, including the Negroni - with Gordon's Gin, of course. At the same Excelsior Bar, Bond notes the odd use of the "feminine" Alexander as a secret signal by Kristatos. There are a few other one-time bond cocktails that make a solo appearance in 007's repertoire including the Pink Gin, Mint Julep, Irish Coffee and Rum Collins. Most of the drink diversity occurs in the novels while the films stick with the few star cocktails that are sure to grab the attention of Bond fans.